I have been using Paperpile for a while now and there are a lot of things to like about it. But as my library is getting bigger the lack of ability to specify the target of a search has become too big a liability. It just is not possible to navigate a large library this way. I have read some forum posts where the devs state that they have a speed target for search. However I don’t understand not using an interim solution, it’s no use having a fast search which brings up tonnes of irrelevant searches. I’m currently looking for another reference manager because of this, but I wish I didn’t have to. Best solution is add ability transfer a folder to Google Drive dashboard - Just have ability in google docs to view all references in an identified folder that holds references for that doc. I have all my references organized in folders, and each tends to tied to a topic and a document. Would be great to add a button on dashboard that lets me just see all references in a folder in DashBoard on side panel. I agree with Tom that supporting richer ways of searching one’s Paperpile library is much needed. Currently I am finding it difficult to search an article even by its author’s full name. For example, searching ‘Lastname Firstname’ does not return anything even if this info is stored in the library. I suggest you search by the first name and then click on the name with the initials in the list. That will specifically filter for this author. Can you clarify what you mean with “lack of ability to specify a target”? Paperpile’s search box is actually a filter box. The more search terms you add the more specific the results will be. Using authors last name, year, and search terms from title and abstract usually filters even a large libraries quite effectively. With “dashboard” you mean our sidebar add-on right? 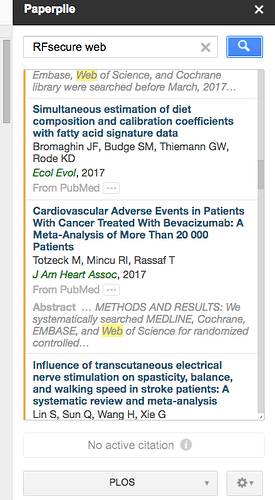 At the moment you input a search and it finds results by searching through ALL fields of the papers. By specify a target I mean specify whether I am searching in the author/title/whatever field. Additionally I’m not always looking for a specific paper but a set of papers and it is hard to make a decent search when the search will trawl through abstracts, multiple authors names titles tags, notes etc and bring out far too wide a selection. If I want to do a web search I’ll do it on my own - that is easy - The DashBoard in Chrome would be more useful if it just had my edited verified library references that I want to site. You can collapse the web citations that it finds and make it search only your library… right? Does the Paperpile team have any updates on their efforts to improve search functionality? Specifically, I’m wondering about functionality enabling searching by specific fields (e.g., intitle:content analysis), handling exact phrases (e.g., “content analysis”), and excluding certain terms (e.g., -survey). As people have noted in this thread and others, the search functionality becomes less helpful when one’s library begins to grow, and especially when search terms have both general and domain-specific uses (necessitating precise filtering). I understand that Paperpile’s database design makes it difficult to implement those features but I’m wondering if the “big update” (that will enable more powerful mobile apps, etc.) has made those changes more feasible and bumped them up on the roadmap. @mkv22 While we appreciate you voicing your frustration and detailing the exact pain points in using Paperpile, please do keep the tone of discussion civil. Jason. The reality is that you guys charge for a product and then chronically under-deliver. Your customer satisfaction is low. Improve your game, and probably you won’t have to question people’s civility. While not perfect (who’s perfect? ), we deliver a very feature rich product and we’ve seen thousands of users switching to Paperpile this year alone. On this forum, we share parts of our roadmap and from time to time the current state of things. We also do invite some users to early betas. I won’t change this policy because I think it makes sense even though it apparently leads to wrong expectations some times. I’ve been absent from the forums for a while because I was actually working on hiring new people and growing our team to implement many of the things discussed here in the forum. It’s a bit sad of course to come back to this discussion being called “chronically under-delivering”. But I’m afraid there is not much we can do about it. We work with more people on more new products/features than ever and even if we ship all these things we have in the pipeline there will be disappointed users because we did no address everything raised here. I hope I will have more time to address specific issues like the searching problems in more detail soon. I want Paperpile to be fully useful.I finished my first paper using Paperpile as ref manager. And it worked. So congrats. There still isn’t any system faster for taking a link and returning the PDF, or for putting a linked ref into a document. You’ve blown away the competition. At the same, you only need to look at your old posts to see where you’ve promised something by a particular time and then you’ve gone silent. That’s frustrating. So either be Apple and never promise anything (but episodically deliver magic), or hit your announced goals and if you don’t, then apologize profusely and don’t whine when we voice our frustration. If you are going to do the Apple route, you need to do magic…I gave you two examples where you did that. But I think that it is fair that the pace of your development (from our end) has slowed down considerably. There hasn’t been any user side magic since Fall of 2016, when my team used Paperpile to manage references on a very large, successful grant proposal (thank you!) But that was nearly 2 years ago. The product hasn’t really improved much in the meantime, especially because the mobile betas are not fully baked. (maybe you’ve done a lot, but we don’t see it… just like no one sees the dozen scientific articles that I’ve almost got published!). Alway remember that those of us that complain the loudest are probably your most rabid customers. We are the ones most invested in your success. Hey @stefan and @jason, I just wanted to follow up on the comment below since we’ve seen a lot of good back-end (and front-end) updates over the past few months. Have there been any developments regarding advanced search functionality? Or can we expect searching to remain largely the same because of the database design? I am pleased to let you know that the current architecture was implemented with advanced search capabilities in mind. I do not have a timeline for this feature at the moment, but it is on the roadmap. Any news on this topic, e.g. searching only in the title of the references? I can click on a publisher (example) and I’ll get all references from that publisher. But is it possible to search directly for a publisher (or journal, conference etc.)? In my experience, this type of search still isn’t possible. Search behaves solely as a filter, without the ability to target particular metadata fields.